Have you set up multiple journals yet? If not, you totally should. Because they’re awesome. You can read all about them here. 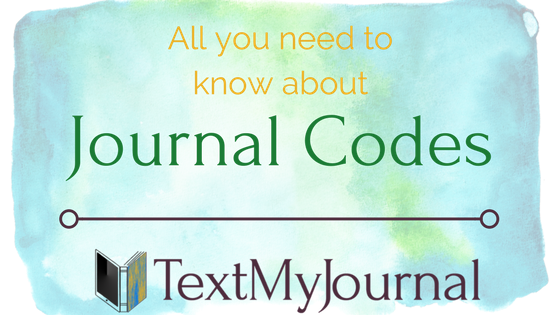 Journal codes are those letters that show up next to your various journals in your dashboard. They’re actually really important because they make sure your journal entries go to the right journal. It means when you send your journal entries via text each day, be sure to start your entry with the journal code. Notice the “FD” at the beginning of the message? That’s the journal code. That will let our system know this message needs to go to your food journal, not your entrepreneur journal or the journal for your kids. What happens if you forget the journal code? The message will be sent to your default journal. Be sure to START your message with the journal code! Ok, great. Got that figured out. Now what? Just be sure to set a journal code you’ll remember! 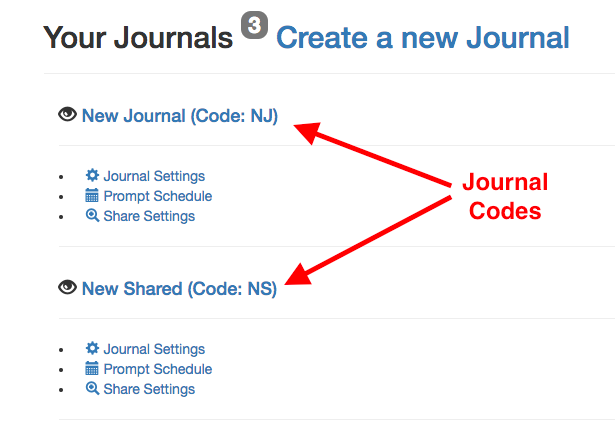 When you create a new journal, you’ll give that journal a name and a code. Enter the code where it says “NJCODE”. Make it something memorable – your kids initials for each of their journals, or ART for your art journal. Whatever you’ll remember, making it easy to keep multiple journals for all your adventures!